In my opinion, the Internet has been one of the greatest achievements of mankind. The ability to share information and ideas instantaneously has changed they way we communicate, do business, develop relationships, conduct research and express ourselves. The Internet is not owned or controlled by any person, company or nation, allowing for material that would be censored to be released worldwide. This has led to - amongst other things - the downfall of goverments and companies with shady business techniques. Let's not forget that the Internet is also responsible for keeping us updated on the world of Cats Doing People Things. However for all the benefits the Internet offers us, it is also a place where we always have to be sceptical, as it's simply rife with misinformation. It can be compared to a game of Chinese whispers; a place where the work of scientists can be bent, twisted and manipulated until it no longer resembles the original work. A perfect example of this can be found in a post named “Genetic Modification Gone Wild: 10 Signs That Our World May Be Destined To Resemble A Really Bad Science Fiction Movie”, whose sources include the Daily Mail, Alex Jones and Sky News. The post is obviously a 'fear piece', created for the most paranoid of readers, which explains why the advertisements on the website are for LPC Survival, Emergency Essentials (C) and for a survival food sale. The only picture in the post is one of a number of human pickled fetuses that have nothing to do with any of the research mentioned and are obviously there to mislead the reader into thinking that they are the product of genetic modification. The post states: “Most people believe that scientists only have our best interests at heart and that they would never do anything weird or dangerous”. It then goes on to say, “Well, read the following examples of genetic modification below and decide for yourself whether or not things have gotten out of control”. The post then lists ten examples of research which the author believes are examples of scientists going too far and may result in the world resembling a “really bad science fiction movie”. They include the development and research of so-called enviropigs, spider goats and monster salmon. Out of the ten examples of “Genetic Modification Gone Wild”, I have given myself the challenge of researching and explaining the reasoning behind one of the more unusual examples genetic modification, in order to show that scientists do indeed have our best interests at heart. The post states: “Science can now produce cats that glow in the dark. A genetically modified cat created by scientists named Mr. Green Genes was the very first fluorescent cat in the United States. But Mr. Green Genes was not the first “glow in the dark cat” in the world. That honor went to a cat created by a team of scientists in South Korea”. Yup, that’s right, Glowing Kitties of DOOM! Look into the face of the abomination named Mr Green Genes and see the dystopian bad science fiction future. Fear him! FEAR HIM! Firstly, you should know that this genetically modified cat does not glow in the dark, he fluoresces under certain frequencies of fluorescent UV light. The post even says that Mr. Green Genes was the very first fluorescent cat in the United States. The fact that the author doesn’t know the diffrence between the ability to glow in the dark (bioluminescence) and the ability to fluoresce, shows the level of scientific knowledge and understanding they must have. The ginger tabby looks like any normal cat until he is exposed to a black light, after which his eye, ears and nose begin to fluoresce. The rest of the cat would also fluoresce, but it’s hidden under ginger fur. The reason Mr. Green Genes fluoresces is because he has been given a gene from a jellyfish, which lets him express a protein called GFP (green fluorescent protein). It should be mentioned that expressing this protein does not give the cat tentacles or stingers, it just makes him fluoresce. Scientists accomplished this by collecting eggs from the ovaries of cats after it had been spayed and then introduced them to a virus containing the GFP genes. A virus then inserts the gene into the egg’s DNA, after which the egg is fertilised and transplanted into the womb of a feline surrogate mother. 66 days later, Mr Green Genes was born. 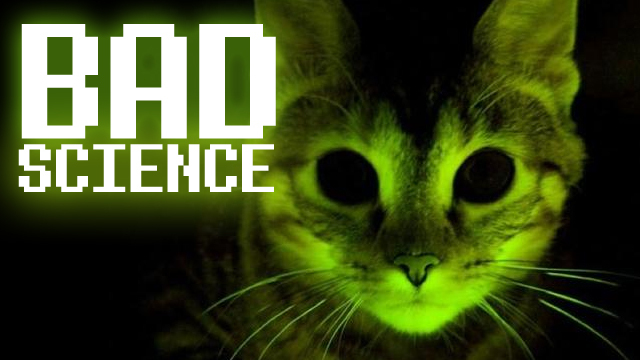 So why would scientists want to create a glowing cat (apart from the fact it’s awesome)? The reasoning behind Mr Green Genes was to investigate this new method of genetic modification; they were not specifically trying to get a glowing cat. This method is simpler and more efficient than traditional cloning techniques, resulting in fewer animals needed for the research. This method could have lots of uses, including a potential cure for type 1 diabetes in humans, by inserting a gene which would allow the diabetic to produce their own insulin. 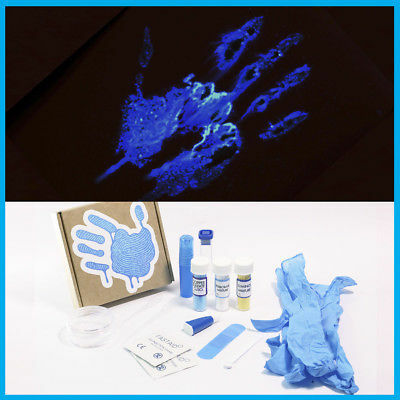 GFP was chosen as a gene to be introduced because it is extremely easy to identify its presence without hurting the animal. In fact, GFP is so useful for this reason, that work carried out on its development and refinement led to its scientific pioneers being awarded the Noble Prize for chemistry in 2008. It is true that scientists in South Korea have used the same technique in the past to create glowing cats (in their case, they used red fluorescent protein), but I don’t know why this is worth mentioning. It’s not even the first example of glowing cats. It is always good to look at all research with a skeptical eye. It is true that not every scientist is doing work that is in our best interest. The best example of this is the work conducted by Andrew Wakefield who manipulated data to show a link between autism and multi dose vaccinations in order to sell single doses vaccinations. The vast majority of research is to benefit mankind and should not be taken a face value. You should always read up on the scientists motivations and their goals before you forming any opinion. 7 Comments on Glowing Kitties of DOOM! This was a great article. I’ve been a fan of your youtube page for a while now, and I was wondering if you could help me with a little bad science problem of my own. The doctor gave me a link to a blog post that amounted to a works cited of various studies that they and other people have published or written when I was expecting a link to one or two papers that I could take the time to read on my own. I am a student who is working towards an education degree in English and Literature studies and as such I do not have access to many of the journals and websites that these studies are published in, nor do I have the time to review the number of papers that I was given. I was wondering if you could look over this research that I was given. If you cannot, do not want to, or can not look over this; could you give me the contact information of someone who would be willing and able to look over this and either give me the information I need to continue the debate, or would be willing to join in on the debate themselves. I would like to have accurate information on my blog and my current situation puts me in a difficult position. Thank you for your time and the content you have shared with the world. Thank you for the help. I will point out that there are a lot of papers in the link. I would only want information on a few of them. and I understand the problem of being overworked. article? I’d really love to be a part of community where I can get suggestions from other knowledgeable individuals that share the same interest. If you have any suggestions, please let me know. Kudos!